All right, it's not every Modern Feminist who consents to being interviewed as she is watching the waves roll while on her honeymoon in Key West. Somehow, though, that's Patrice. Patrice Lee, an IWF senior fellow, whose blogs and opeds are familiar to frequenters of this website, had become Patrice Lee Onwuka just a few days earlier in a beautiful ceremony, held in New Orleans' historic French Quarter. The groom: Victor Onwuka, and it was love at first intense conversation at a church young adults evening (but we'll get to that). A graduate of Tufts University with a belief in small government and self-reliance that may be uncommon in her Bernie-friendly generation, Patrice, 33, has an unusual history. Our senior fellow mini-bio on IWF's website notes--aptly--that "Patrice’s unique background fuels her passion to defend freedom and faith in America." Patrice was born on the tiny island of Montserrat in the Leeward Islands in the Caribbean. She and her parents and her older brother came to the United States in 1985, when Patrice was two. It wasn't an easy decision. "We had a comfortable life, but my parents were looking to the future and they knew that we were not going to have educational opportunities in the Caribbean," she says. "They left to give us the opportunity to go to college and pursue different careers. It was tough to uproot our lives and leave everybody we knew behind, but it paid off." The Lees settled in Boston, and, although a relative newcomer, Patrice managed to pass the stiff exam to get into the famed Boston Latin School. Founded in 1635, Boston Latin is considered the first public school in the U.S. Its alums include five signers of the Declaration of Independence--and Patrice had the same Latin requirement that was in place when these Founding Fathers were students. She is also fluent in Italian. "You sacrifice, you work hard, and you get your education," is how Patrice summed up her family's philosophy. Her mother is a manager in a large accounting firm, and her father is a safety consultant for a construction company. All three Lee children are college graduates. At Tufts, Patrice majored in political science and economics. "Tufts was my second choice," she admits. "I wanted to go to Harvard, like my older brother, but I went to Tufts instead and I absolutely loved Tufts University--and it was just as rigorous." Her studies gave her a taste of both "the wonky side and the communications side" of politics. After Tufts, she went straight to graduate school at Boston College for a master's degree in international relations. Along the way, Patrice was dipping into the writings of Austrian economist Friedrich Hayek, the defender of classical liberalism, and American economist and Nobel laureate Milton Friedman. Her in-depth reading of Hayek and Friedman came later as a Koch Associate, but even early on, "something clicked" with Friedman and Hayek. Their philosophies, she says, "resonated with more than the Keynesian model of pumping public money into an economic system." She was also developing a skepticism of too much government involvement in people's lives. "Something ingrained in me said that we do things better as individuals. You don't need somebody to give you something. You are better off when you set goals and go after it yourself," she says. These views were soon to be tested in a new job--speechwriter for a U.N. official with the laudable goal of ameliorating the economic conditions of people in Africa. Just one problem: he saw growing government programs as the way. "He was too in favor of big government and the Keynesian model. I just could not help him inculcate these ideas into the minds of college students. I said, 'No, the private market is the solution,' and so I resigned," she recalls. 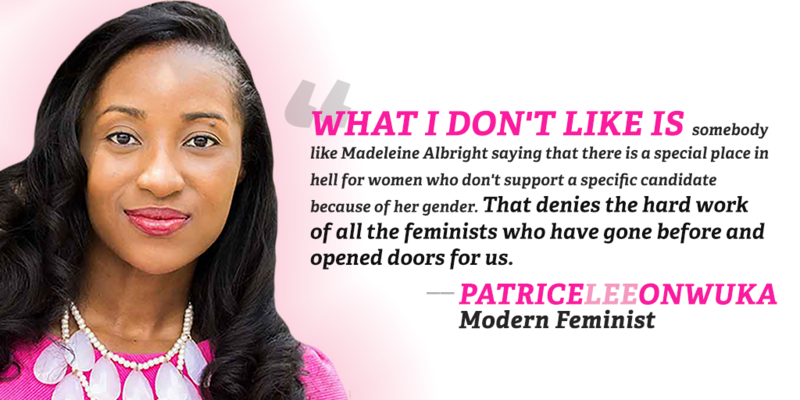 While a believer in private solutions, Patrice is not against temporary government help to those in need. "I definitely believe it is important to have a social safety net, but it should be temporary and targeted, but we've seen it go from being temporary and a springboard to becoming a permanent trap. What we don't need to see is intergenerational poverty, which is what happens when people are raised to believe that somebody else will do something for them." After resigning her job as a speechwriter, Patrice headed for Washington, D.C., where she furthered her studies and gained professional experience through the Koch Associate Program at the Charles Koch Foundation. It is designed for people who are passionate about the free market. She has worked as a communications and policy specialist at The Philanthropy Roundtable and the Fund for American Studies. As Director of Outreach at Generation Opportunity, she promoted economic opportunity for Millennials--and became something of an expert on that mysterious generation to which she belongs but which is so baffling to many of us outsiders. Why, for example, are so many Millenials so smitten with Bernie Sanders, the socialist who is giving Hillary Clinton such a hard time in her bid for the Democratic nomination? "Bernie Sanders is popular," Patrice answers, "because he is saying some things that are not far wrong, although his solutions are the wrong ones. He says, for example, that the system is rigged. He's actually right about that, but the problem isn't capitalism, it's crony capitalism that's rigging the system." She notes that when established businesses try to use government to stack the deck against newcomers, that is unfair and it is crony capitalism. But above all, it is important to remind young people that government is rarely the efficient solution. "When we think of government," she says, "we don't think Apple, we think DMV." She is optimistic about Millennials, however. "We are the generation who sixteen years ago created Facebook and Facebook started a social media revolution," she says. "We rely on Yelp more than on hotel concierges when we want to find restaurants. We don't rely on traditional sources of information. Our sources of information are each other. We were taught every day in school that we could change the world." She concedes that sometimes Millennials don't want to put in the grunt work to get to the top and adds that many are seriously burdened by student loan debt. "We do need to educate Millennials about socialism and why it fails," Patrice admits. "We need them to know that you can have free college, but if the quality of education is inferior, so what? You can have free health care, but if you have to wait in line forever to get it, that is not so great." The most important thing, she insists, is instilling a sense of the possible. Even in the sluggish economy of the last few years, she says, Americans today should feel that they can achieve great things, if they want to. "Opportunity is here waiting on a platter if you are willing to put some diligence into getting it," she says. Patrice would like to run for political office someday but she also sees herself as creating a nonprofit that enables kids from lower-income families to have the same kinds of apprenticeships and internships that more affluent young people take for granted. Such jobs, she says, help teach skills and virtues necessary to move up in the workplace. She considers herself a feminist but not one who eschews traditional roles for women--she plans to have children and became a stepmother when she married Victor. She acknowledges that she owes a debt to the feminist movement, but adds, "What I don't like is somebody like Madeleine Albright saying that there is a special place in hell for women who don't support a specific candidate because of her gender. That denies the hard work of all the feminists who have gone before and opened doors for us." And about Victor--they met at an evening for young adults at the Cornerstone Church in Bowie, Maryland. Friends had "dragged" her there when she didn't want to go, but she and Victor, 35, had a serious conversation--and she suspected that night that he was the one. They were married at the elegant Dauphine Orleans Hotel in the French Quarter, with friends and family in attendance. We wish them all the best and especially thank Victor for permitting a brief interruption into his honeymoon from the Portrait of a Modern Feminist department.